Drip Pan Kits (DK-SS) are specifically designed for use with BHS Single System System Stands. 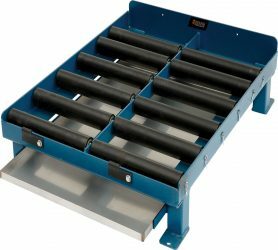 This essential maintenance equipment slides on rails beneath the battery compartment to contain spills and leaks. This simple measure prevents costly floor damage and helps maintain a safe environment in the battery room. Custom sizes are available to fit third-party stands. BHS Drip Pans are constructed of stainless steel and are corner-formed to prevent leaks and corrosion associated with welded seams. They are electrolyte-resistant and slide easily removed so cleaning is simple and fast. Universal Polypropylene Roll absorbent pads and AcidSorb Pillows are available to make containment of corrosive material even simpler. BHS Drip Pan Kits provide an powerful solution for containing spills and leaks under battery stands. Contact our sales team at +1 314 423 2075 to find out more about how Drip Pans can make warehouse maintenance easy.